Our pals over at Hoonigan — World Rally Championship participants, makers of the wonderful Gymkhana videos, and purveyors of great auto enthusiast merch — found themselves the victims of theft in Los Angeles this weekend. Can you help them get their trailer back? Let&apos;s say you had the ultimate car — where would you take it? 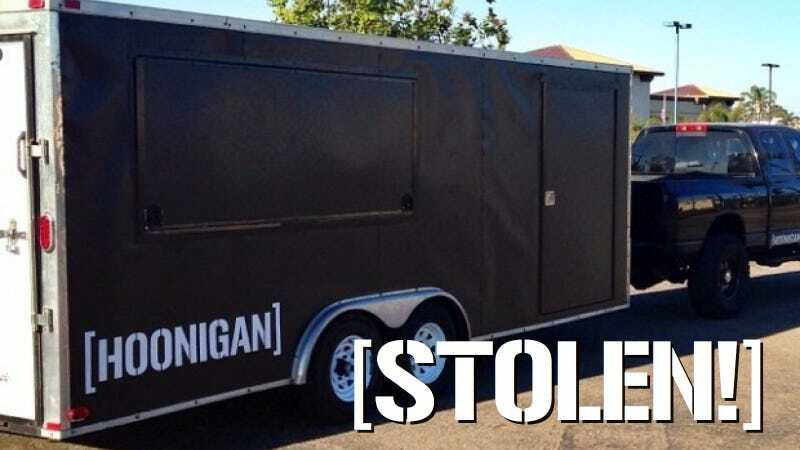 Hoonigan reported on their Facebook page that a 20-foot combined enclosed trailer and merchandise booth was taken from downtown L.A. Its base color is white but it has an all-black wrap with the Hoonigan logo. One side has a pop-up door as seen in the photo. I reached out to Hoonigan to get some more details on the theft, including where and when it was taken and what license plate number it has. I'll update this post if I get more on what happened. Until then, anyone with information is asked to email hert@hoonigan.com. Let's see if we can help Hoonigan find their trailer! Update: Here's what Brian from Hoonigan told us in an email. We were lucky, the trailer was empty, aside from 10 or so tires. The trailer was taken from our place in DTLA. The chain on our gate was cut and they must have also broken the tongue lock we had on the trailer. Since so much effort was put into getting the trailer, I can only assume they hoped to find one of our cars inside. There's a good chance it's already been ditched, and someone will spot it. The trailer was a 24 foot enclosed unit with a concession door cut into the passenger side. This will be the best identifying feature as it was a custom job and does not match the hardware used on the rest if the trailer. We use the trailer both for moving cars and merch sales at events. The trailer is white underneath the flat black vinyl. The trailer had Hoonigan logos on the back bottom on both sides. We assume the trailer was stolen between 1AM and 5PM on Sunday. We reported it Monday AM at 6:30AM. We know the time line as I was at the shop Saturday night and Matt from fifteen52 who shares the space with us noticed the lock undoen on Sunday but it didn't occur to him the gate was popped, he just thought it was left open. It was dark, he missed the broken links of chain on the floor. Something of interest is that there have been a wave of trailers getting stolen in the SoCal region over the past year. I feel like every month I hear about another car and trailer gone missing in motorsport. Again, lucky for us, ours was empty. Additional photos are below. If you see the trailer, please call police or email Hoonigan.